No, there weren’t so many riders when I rode Pikes Peak. This and all other photos in this post were taken by other people. I was so cold by the time I got to the top that my fingers would barely allow me to take an obligatory selfie to show I’d been there. But to back up a little. I like lists of things to do, things that take some physical effort. I’m not particularly interested in lists of things to passively see, or lists that can be accomplished by spending money rather than effort. I like lists because they take me to places I wouldn’t otherwise go, and help me do things I wouldn’t otherwise do. I like lists that take physical effort because you have to put yourself into their accomplishment rather than putting in your money. An example of my sort of list is hiking the Colorado 14’ers. Another example is the bike rides in John Summerson’s book, The Complete Guide to Climbing (by Bike). This book inspires me to go places to do the rides he describes, and sometimes gives me rides to do when I’m in a particular area. An example of the latter was riding Sandia Crest when we drove from Tucson to Boulder. 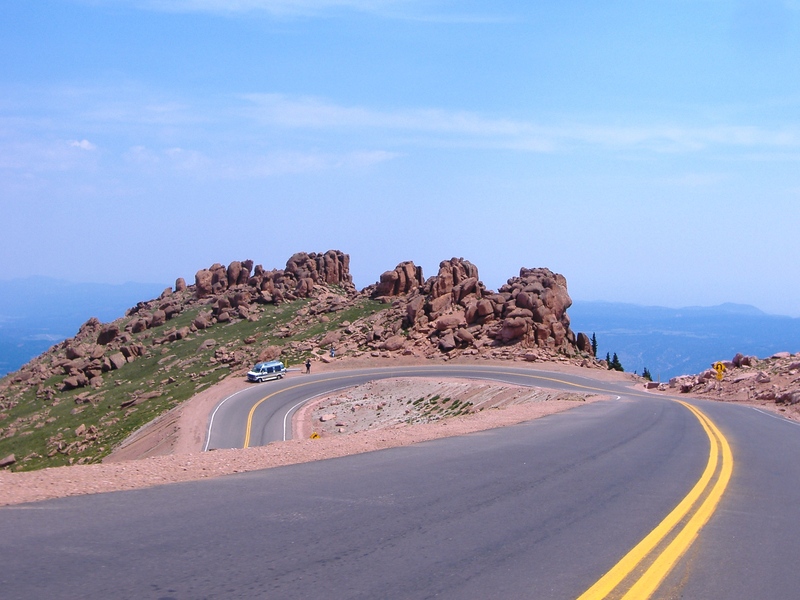 Another example is the Pikes Peak Highway. This has only recently (January, 2013) been open to cyclists and is not described in the first edition of Summerson’s book. It’s listed in the second edition book as being the second most difficult climb in the U.S. I don’t know if it’s really number two, but it’s definitely somewhere up there. 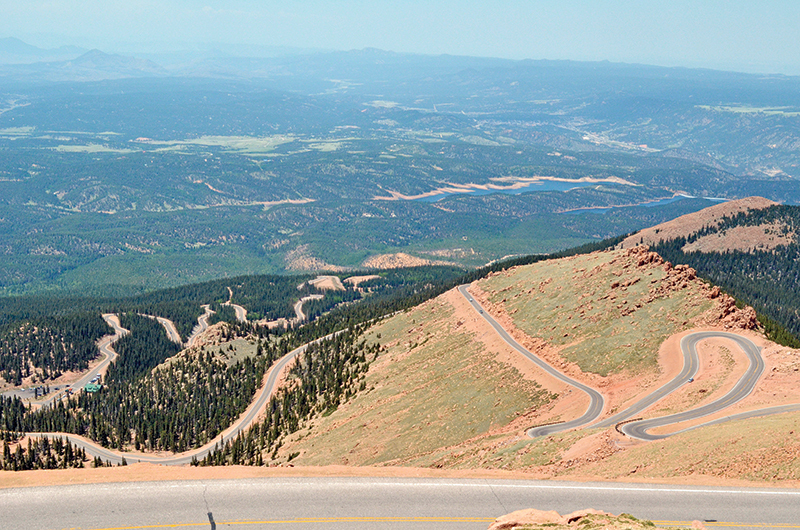 The upper 12.5 miles of the road used to be dirt, and was the course of the famous Pikes Peak International Hill Climb auto race, first held in 1916. The road became very popular with tourists and by 1997 some 300,000 a year were driving up. Not always down though – some people were so scared by the experience that Forest Service employees had to drive their cars back down. Bicycles were not allowed on the road. In 1998 the Sierra Club sued the city of Colorado Springs, claiming that the city was adding 150,000,000 pounds of gravel a year to the road (another article mentions 1,500,000 tons of gravel over 20 years, which comes out to more or less the same thing, but 150,000,000 pounds a year looks much more dramatic). This was to replace the 150,000,000 pounds of gravel that was washed away each year, filling streams and alpine lakes, and creating a layer of gravel 2-4 feet deep in the forests. The agreement between the Sierra Club and Colorado Springs called for the road to be paved by 2012, and on October 1, 2011, ten years after starting, the paving was completed. Bikes were still not allowed, except for a single race up the mountain. Then in September 2012, cyclists were allowed up the mountain for a month as an experiment. The experiment finished, no one died, and the road was officially opened to cyclists on January 1, 2013. I rode it on June 17, 2014. So what is the climb like? Well, it’s difficult. It’s mainly the top 6 miles that are difficult: steep, above treeline, lots of switchbacks, not so much oxygen. And when I rode it, windy. If you ride from Manitou Springs as Summerson describes, his book says it’s 25 miles and 7,882 feet of climbing (my Cyclemeter phone app showed 8,300 feet for the round trip.) According to Summerson it’s the 2nd hardest climb in the US, or the 5th hardest if you pretend that altitude isn’t a factor and look only at steepness and length. It’s a hard climb, and for me it was made harder still by the strong wind that was blowing for the last 6 miles. The weather forecast for Colorado Springs said there would be 20 mph winds the day I chose to ride, but I went there anyway because it wasn’t looking any better the next few days. I doubt the winds always blow, but the woman at the pay station said that I wouldn’t have been allowed to ride the previous day as the winds on top were 60 mph! From the pay station to the top is 19 miles. The city of Colorado Springs’ web site suggests starting the climb at the Crystal Reservoir Visitor Center, which would make the climb 12.5 miles and 4,880 feet of climbing. If you start in Manitou Springs, the only free parking is behind the Tajine Alami restaurant. There are signs on the street directing you to the free parking.